By joining this challenge, you're going to walk in the shoes of Azzah to raise awareness and funds for COHI. For one day of your choosing, you will eat her local diet and share your food images on social media, using #inhershoesCOHI. We welcome you to also blog about your experience. Find easy downloadable social media guidelines and your shopping list below! 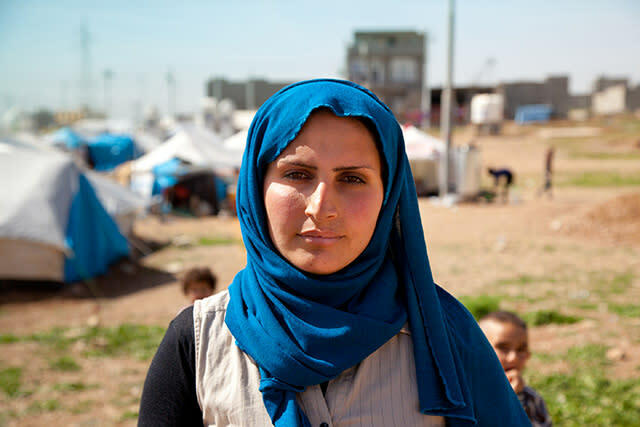 Azzah works as a teacher in Jableh, Syria, and is six months pregnant with her first child. From the start of her marriage, she has faced abuse from her husband. Since the Syrian army began enlisting men in the neighborhood, her husband's patience is running especially thin. As the violence becomes worse, she fears for the safety of her unborn child. Azzah must make the decision to flee to Europe in search of safety, not only from the escalating civil war, but from her own marriage. Since the civil war began in 2011, Syria has been increasingly destabilized by splintered rebel groups and the encroachment of ISIS. Today 13.1 million people in the country need humanitarian assistance. The region of Eastern Ghouta has been especially hard hit, with more than 1,400 civilians killed over a 30 day period, including 301 children and 185 women. The UN estimates 400,000 people are trapped inside Eastern Ghouta, many of them increasingly running out of food. More than 5.6 million Syrians have fled the country as refugees, and 6.1 million are displaced within Syria. Most Syrian refugee camps are hastily constructed and poorly funded, leaving little resources or protection for mothers and children. More than 1 million refugees have sought asylum in Europe. Food insecurity and malnutrition plague refugees throughout their journey from initial food insecurity at home, lack of food aid in camps, to the uncertainty of food resources on the road.